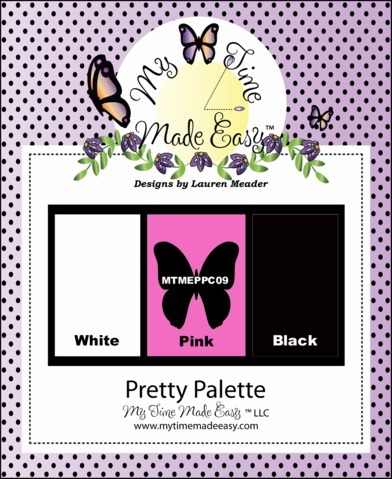 It’s time for another fabulous Pretty Palette challenge, MTMEPPC09!! Isn’t this flower amazing?! It is a digi from MTME’s April release Bee-Loved. The sentiment is part of the Bee-Loved Sentiments set. 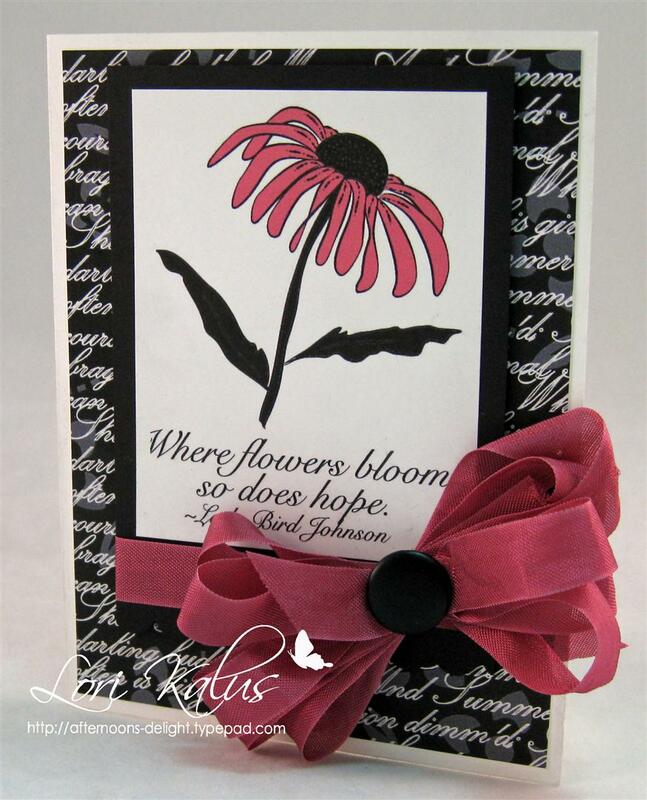 I thought Love Notes digi patterned paper was a perfect complement to the flower and sentiment! I used seam binding for the bow. This sketch is from Lizzie Ann Designs LAD64. Tagged Cards, Lauren Meader, Lizzie Anne Designs, MTME, Stampin' Up! I’m back to post my second Father’s Day card…my fav! This one is for my dad and my DH. I know they’ll love it! I just love this SU! set (Under the Stars), so cute! I paper pieced the bear and sleeping bag. The raccoon is stamped on Basic Gray, cut out, and attached with dimensionals to “peek” at the bear. The trees are punched using my EK Success Alpine Trail Edger Punch. 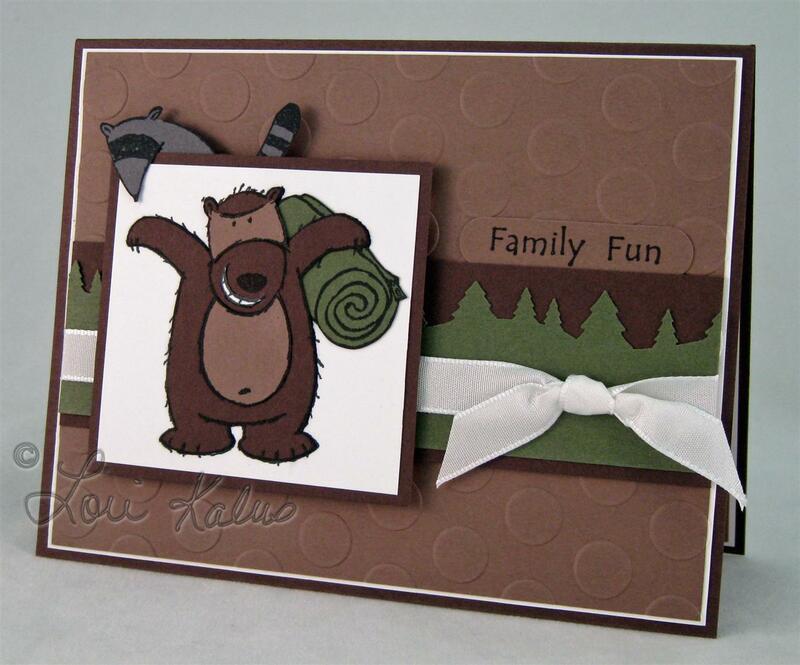 I embossed the background with a Polka Dot ef. The sentiment is from Gina K’s set Happy Camper. Play along with this Lizzie Anne Design sketch! If you haven’t been there before, check out their blog. It’s full of fresh, fun ideas and inspiration! Folder, EK Success Alpine Trail Edger Punch, Word Window Punch, White Taffeta Ribbon, Dimensionals. Tagged Cards, Lizzie Anne Designs, Stampin' Up!